In past generations, overuse injuries from tennis, basketball, baseball and other sports were pretty much the province of professional athletes and aging men and women. Now, because of kids’ aggressive sports schedules, pediatricians and orthopedic physicians report that they are seeing “wear and tear” injuries in children of younger and younger ages, which is of great concern for those young bodies. In fact, new research from the American Sports Medicine Institute (ASMI) in Birmingham, Alabama, has found a direct correlation between the number of innings played by the pitchers in youth baseball and the likelihood of injury in years to come. Based on the findings, researchers hope that youth leagues will establish and enforce a 100-inning-per-year limit — and I’ll weigh in here and say that I’d like to see similar, commonsense standards applied to other youth sports as well. “Years ago, most youngsters played organized baseball only in Little League and school teams,” says Glenn Fleisig, PhD, lead author of the pitching study and research director for ASMI. “But a sharp rise in travel teams is giving kids the opportunity to play organized baseball more months of the year.” Today, a young pitcher might pitch 30 or 40 games a year (at six innings per game, that’s as many as 240 innings) — compared with 10 games a year in previous generations — which has led to an increased number of elbow and shoulder injuries. And these are kids in primary and secondary school! The study participants included 481 boys between the ages of nine and 14 who were followed for a decade. They were asked, yearly, whether they had pitched… if so, how many innings… whether they had had an elbow or shoulder injury that resulted in surgery or retirement from baseball. 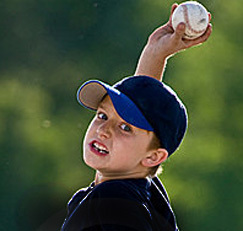 Researchers found that boys who pitched more than 100 innings in a year were 3.5 times more likely to be injured. Playing pitcher and catcher in the same game also appeared to increase the risk for injury. Most elbow injuries involve the ulnar collateral ligament of the elbow, known as the Tommy John injury after the professional pitcher who tore this ligament in the 1970s and then made a very unlikely comeback after innovative surgery to replace it. Shoulder injuries usually involve the rotator cuff tendons or the shoulder capsule (the ligaments that wrap around the upper arm bone connecting it to the shoulder socket). Stop when tired. Pitchers who end up needing surgery as a result of overuse tend to be the ones who kept pitching when they were fatigued. Rest is important. Pitchers should avoid overhead throwing completely for at least two to three months a year — although a four-month break from competitive baseball pitching every year is preferred. Keep track of innings pitched. Learn and adhere to the recommended limits for pitch counts and days of rest (one to four days, depending on the number of pitches). You can find details on the ASMI Web site, http://www.asmi.org/asmiweb/position_statement.htm. Do not pitch on multiple teams with overlapping seasons unless you can keep to the guidelines above. Learn and use good throwing mechanics (just as pro pitchers do). There are many young pitchers who are effective on the mound — for now — but whose pitching form is almost guaranteed to overstress their arms and shoulders. Working with a fitness coach and pitching coach/instructor is a good idea. Avoid using radar guns to frequently measure the speed of young pitchers’ throws. This may lead them to focus too heavily on speed at the expense of protecting their arms. Do not pitch and catch in the same game. Don’t “push through” pain. If a pitcher complains of pain in his elbow or shoulder, get an evaluation from a sports medicine physician. Encourage young pitchers to have fun playing a variety of sports so that they strengthen different combinations of muscle groups and avoid overuse. Glenn S. Fleisig, PhD, research director, American Sports Medicine Institute, adjunct professor, department of biomedical engineering, University of Alabama at Birmingham, and pitching safety consultant for Little League Baseball & Softball.